Give back to the community and benefit your company all at the same time. We are always looking for businesses to support local theatre by advertising in our play programs. Ticket sales cover just 40% of our annual expenses, even when shows sell out. As a non-profit organization, we depend upon the support of program advertisers; show sponsors and individual contributors to help us balance our budget. Your program ad fee helps to subsidize production costs and allows us to maintain the kind of artistic quality our community has come to expect and enjoy. Your advertisement will be featured in all program issues (a minimum of 12 issues) during each six month time period and will be viewed multiple times by a captive audience. In addition to reading their Markay program before each performance and during intermission, most audience members take their programs home for further browsing, due to the biographical information about the performers and other content. By advertising with the Markay your business will enhance its reputation as a community booster. You will also help strengthen an organization that attracts visitors to Jackson, Ohio. Over 25% of our audience comes from outside of Jackson. At last count, just about 65% reside in Jackson, 10% come from Coalton, Wellston and Oak Hill and elsewhere in County. The remaining 25% come from other counties in Ohio or from out-of-state. 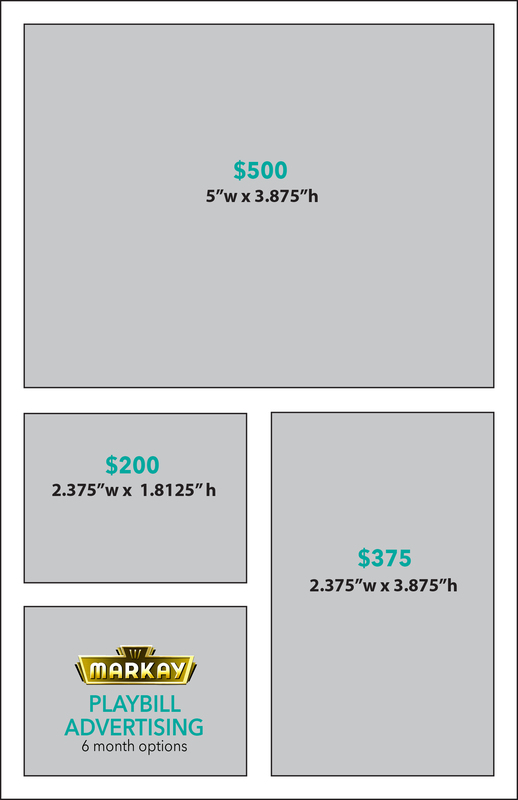 Semi-annual ad contract prices range from $200 for a 1/8-page ad (2.375” wide x 1.8125” tall) to $500 for a half page (5″ wide x 3.875″ tall) spread. Your contributions are tax deductable because the Southern Hills Arts Council is a 501 (c) 3 designated non-profit organization. To find out how your business can advertise in Markay programs, email us at info@markayjackson.org or call us at 740.286.6355.